Celebrating the work of renowned Italian film composer, Ennio Morricone, known for his scores to Spaghetti Westerns. He composed over 500 scores for film & TV, plus over 100 classical works. Intersection will present some of Morricone’s most beloved scores full of character, beauty and rhythmic vitality. While admission to all music concerts is FREE, you may UPGRADE to Reserved Seating which includes a catered Four Course Dinner with Wine for $95! Dinner begins at 7pm and the music starts at 8pm. Dinner/Reserved Seating Tickets are extremely limited and sell out in advance every year – so please make your reservations soon! 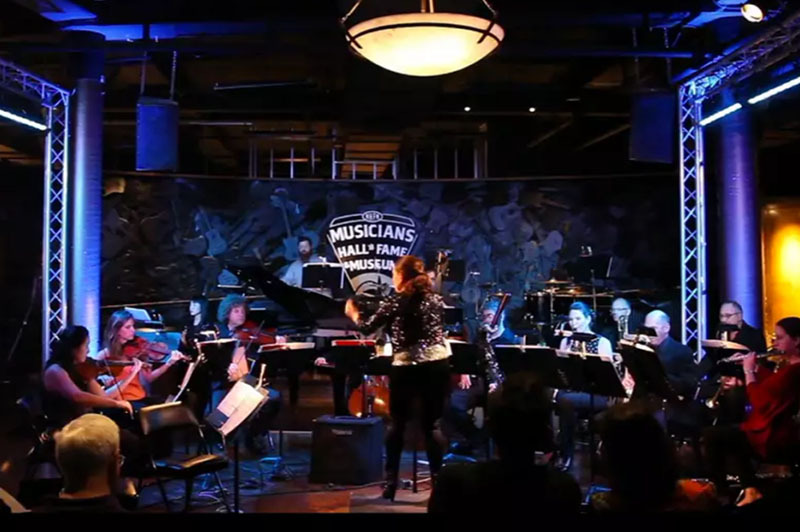 INTERSECTION was born from Kelly Corcoran’s desire to bring a professional contemporary music ensemble to Nashville. With INTERSECTION, Corcoran is setting out to challenge the traditional ways that audiences interact with music in the concert experience and to expand the musical language of Nashville, by focusing on repertoire from the 20th and 21st centuries for medium-sized ensembles. With a great deal of experience in musical programming for families, Corcoran also aims to introduce young audiences to contemporary music, something that few contemporary music ensembles are doing. Ginger began her Nashville career almost 30 years ago at Opryland, where she performed in almost all of their shows and was featured in an NBC television show. She has performed with such artists as Gene Kelly, Ben Vereen, Andrea McArdle, Steve Allen, Cab Calloway and Chita Rivera. She has also been a featured soloist with the Nashville Symphony and starred in the Nashville Opera. Ginger also played the leading female character in the first national tour of “My Way! A Tribute to Frank Sinatra” among other work with the Tennessee Repertory Theatre. Reserved Seating and a Four Course Wine Dinner prior to the show! Purchase your tickets now for a delicious Four Course Wine Dinner and a front row seat for either of our free concerts. Dinner begins at 7pm on both night. Only 100 seats per night are available so DON’T WAIT! Dinner Tickets sell out in advance every year.